I have written so much about what has happened over the last two days but I have not quite finished or publshed anything yet (it will come). But the video below sums it all up. The context is as follows. Today I went out with Benito Xaverly, one of the Area Sales Manager for Dar Es Salaam. He’s a Business Administration graduate and until recently he worked for Pepsi. 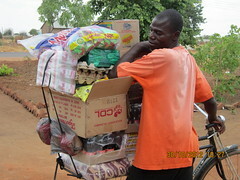 He had not heard of ColaLife before we got in the vehicle and started on our journey. 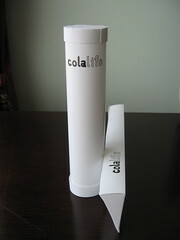 We visited 7 of the 17 MDCs that he manages and I took the mock-up ColaLife Pods I made yesterday. Here they are in Coca-Cola crates. They fitted! Here is the video. The first 1min 15secs is in Swahili as Benito explains the ColaLife idea to the people who work at the MDC. Then it breaks into English . . . . it’s very interesting what is said . . . .
Can anyone translate the Swahili? I only catch a few words: they are talking about putting medicine in the packets and distributing it out. 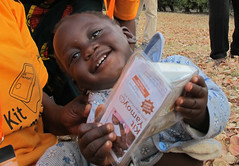 ‘It’s a good idea, especially in Africa, the distribution of this medicine is very difficult. But the soda is being distributed very aggressively – it’s going to a lot of places… by doing this Coca-Cola will be doing Social Responsibility…. For me, this is a good idea (indicates the triangular package).. but to remove one bottle, this is a problem. Many people think ‘my sales are being reduced.. they are reducing my sales.’ …. Benito thinks the pakage would need to be waterproof, because of the rain. But it should be disposable. It will be too difficult to have it returned to the depo, but it would have to be made in plastic. Is brilliant to see you taking the idea to the coalface and seeing the response. I’m sure there are plenty of good designers out there who’d be prepared to take on the challenge of creating something waterproof, disposable (or even better reusable in a different context such as a mosquito net), and that doesn’t mean having to lose a bottle which understandably would upset vendors. Thanks David but you tought me all I know (and not just in social reporting!). Benito explaining the ColaLife idea to the people who work at the MDC and the discussion you guided, + listenning to the people in the field and finding the best approaches with them: brilliant! La explicación de la campaña “Cola-Vida” compartida por Benito con las personas de MDC, la discusión que guiaste… y el escuchar a las personas de campo – para unidos encontrar las mejores estrategias – son métodos brillantes.